باغی پور, رضا, حسینی, سید مهدی. (1393). Optimal Placement and Sizing of DG in Capacitor Compensated Distribution Networks Using Binary Particle Swarm Optimization. مجله علمی-پژوهشی رایانش نرم و فناوری اطلاعات, 3(4), 29-37. رضا باغی پور; سید مهدی حسینی. "Optimal Placement and Sizing of DG in Capacitor Compensated Distribution Networks Using Binary Particle Swarm Optimization". مجله علمی-پژوهشی رایانش نرم و فناوری اطلاعات, 3, 4, 1393, 29-37. باغی پور, رضا, حسینی, سید مهدی. (1393). 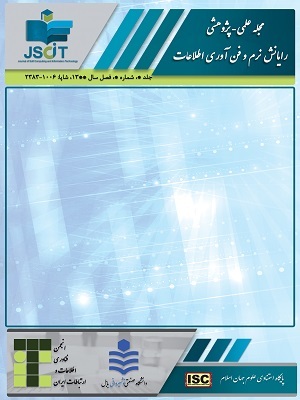 'Optimal Placement and Sizing of DG in Capacitor Compensated Distribution Networks Using Binary Particle Swarm Optimization', مجله علمی-پژوهشی رایانش نرم و فناوری اطلاعات, 3(4), pp. 29-37. باغی پور, رضا, حسینی, سید مهدی. Optimal Placement and Sizing of DG in Capacitor Compensated Distribution Networks Using Binary Particle Swarm Optimization. مجله علمی-پژوهشی رایانش نرم و فناوری اطلاعات, 1393; 3(4): 29-37. This paper presents a binary particle swarm optimization for optimally determining the size and location of distributed generation (DG) and capacitor in distribution systems. The main innovation of this paper is using both of DG and capacitor for the reliability improvement and power loss reduction. For this purpose an objective function consisting of reliability cost, power loss cost and also DG's and capacitor's investment cost are considered. The effectiveness of the proposed method is examined in the 10 and 33 bus test systems and compared with genetic algorithm method. The results obtained show appreciable reliability improvement and loss reduction while simultaneously using DG and capacitor.